An automated part-straightening system combining electromechanical servo presses with real-time straightness measurement and feedback has been introduced by Promess, Inc., Brighton, MI. Based on the company’s field-proven electromechanical assembly press (EMAP), the PRO process monitoring and test system, and sensor technologies all integrated with Promess-developed Windows-based, icon-driven software, the new Tweak-O-Matic straightening system straightens sheetmetal stampings, machined parts, extrusions and tubular assemblies. 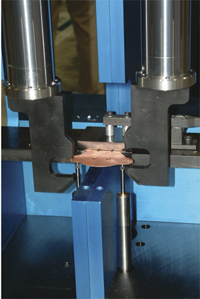 The system employs a pair of EMAPs, one on each side of a part-clamping fixture. After the part is clamped, the rams move into contact and their position is communicated to the control via the PRO modules. By comparing actual part location to a pre-determined standard, the system can determine if the part is flat. If so, the part is unclamped and passed down the line. If not, the presses work in tandem to move it in the appropriate direction. Since there are two rams, with coordinated motion, the straightening operation may be push-pull, push-push or pull-push with the direction, distance and force calculated by the PRO control modules. It’s a repetitive move-measure-move process, with the control using gauge feedback and press position information to apply necessary force to achieve desired flatness or straightness.